From Horny Lomna via Slowakia to the source of the Odra, situated close to the Fidluv Kopec mountain, 633 metres altitude at the verge of an enclosed area used by the czeck army. 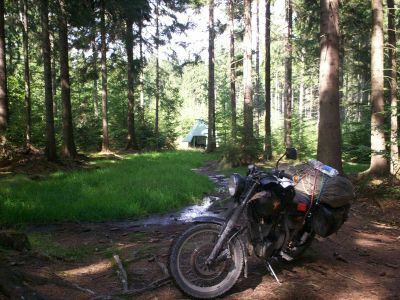 In the middle of a forest I get stuck in muddy soil, the beginning of a journey towards the Baltic Sea, first as an untamed, untouched meandering river, soon to be welcomed by Ostrava's industrial estates, to be tought the first lesson. Still a young river, the Odra becomes used, abused and tamed. And on and on along the dykes protecting the lowlands from the water, along the villages and lush meadows which feed the cows, passing an infinite number of anglers along the way. Sometimes, as last in 1997 the Odra burts into a rage, taking away houses, farming machines and lives, lapping over the dams, taking everything it takes hold of. Further downstream the river meets the Nysa, and together they are even stronger, rolling along in a wide and slow pace. Through unaccessible wetlands towards the Baltic Coast where the river vanishes into the sea; a mighty river's journey's end. But here in the forest it all begins, and here, I bade farewell to what has become a good companion. The clouds move in fast from the west, now I can go home.